It doesn�t seem that long ago that we were confidently predicting that our Targus USB Card Reader should see us in good stead for the future with its ability to read 14 varieties of memory card. Sadly, the recent purchase of a SHDC-capable device proved us wrong. Although the SDHC card fitted in the reader�s SD card slot just fine, it wasn�t interested in playing ball and a brief search on the web confirmed our fears: the Targus and SDHC get along like Cardiff City and Swansea City fans. Reluctantly, we headed off to the bright lights of Tottenham Court Road and after a bit of the traditional haggling shelled out £20 or a SanDisk ImageMate 12-in-1 Card Reader/Writer (you can pick it cheaper online now). 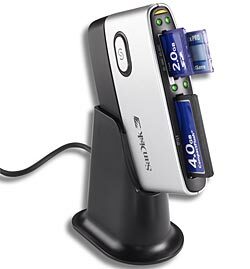 The SanDisk ImageMate comes with a natty plastic stand which angles the slots at a convenient angle and stops the unit being dragged all over the desktop. The reader can also be detached from the stand and used flat on the desk, if so required (handy if you want to travel light). Connecting via your computer�s USB 2.0 port, the SanDisk comes with a �smart button feature� which uses the bundled software to automate the transferring of images to your PC. In reality, we turned off this feature as we prefer to move images about manually, but it could be a boon for folks less pernickety than us. 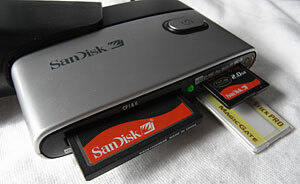 In use, the SanDisk did exactly what it said on the tin, transferring images from every card we threw at it, all zipping across at a fair rate of knots without any problems. 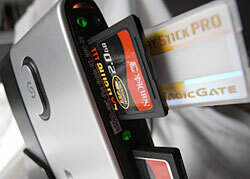 A handy status orange light tells you that the unit is connected to a USB port, while a green light acts as confirmation that a card has been inserted in each slot. This blinks when data is being transferred. Admittedly, card readers aren�t the most exciting things to review, but this fella stands above the crowd for its standard of construction, no-brainer image transfer software and handy stand. The short USB cable was a bit of a bummer though. No additional driver installation required for Windows ME, 2000, XP and OS X v10.1.2 plus.